After doing a recent television segment on the issue of college prepayment plans and college investment accounts I received an avalanche of inquiries from parents wanting more information that what can be conveyed in four minutes. If you’ve been wanting to know more about how to save for your child’s college education, here’s the 411 on 529 plans for college. 529s are tax-advantaged savings plans created to encourage people to save for future college expenses. They are sponsored by states, state agencies or educational institutions and are authorized by Section 529 of the Internal Revenue Code. For starters, it’s important to understand that there are two types of 529 plans: One is a pre-paid tuition plan and the other is a savings plan. And while they are great ways to save money for your child’s future education, you must also know that both of them will be treated as parental assets in the calculations of the expected family contribution towards college costs. This might limit your child’s eligibility for federal financial aid. So as everything else, you must evaluate and decide what’s more convenient for you. It’s sponsored by some states, not all, and it generally allows you to purchase units or credits at participating colleges for future tuition. This means that depending on the age of your child at the time in which you enroll in the program, you can either pay a lump sum or monthly installments that guarantee that by the time your kid is ready to enter college, the tuition (and in some plans room and board) will be covered. These plans typically lock in at the tuition rate at the time you start the plan. To find what is offered by your state, visit the College Savings Plans Network. This program locks in tuition prices at the eligible public and state universities. They are usually backed by the state. Most plans have a limited enrollment period. There are no penalties if your child decides not to attend university and none of his/her siblings wish to attend either (hopefully not your case!) You’ll receive a full refund. The money can be used for participating public colleges outside of your state of residency and it can go towards a private college education. But if your child attends a private college, the plan will only cover the cost equivalent of a public education at your state schools. There are enrollment and administrative fees involved that you may be able to avoid by buying the program directly from the plan’s sponsor. 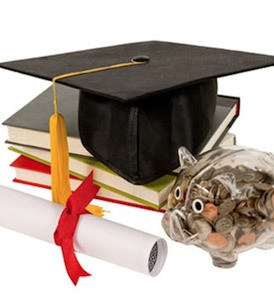 These plans allow you to establish an account for your child with the goal of paying his/her college expenses. You can usually choose among different investment instruments such as bonds, stocks, money market, etc. The portfolio is managed according to the age of the child. The closer they get to high school graduation, the more conservative the investment gets. These accounts have the benefit of being tax free, as long as you use the money to pay eligible educational expenses. This program doesn’t lock the cost of college and there is no guarantee that by the time your kid is ready to go to college, you’ll have all the money required in your account. It covers all higher education expenses such as tuition, room and board, mandatory fees, books, computers, etc. These accounts are not guaranteed by the state and most investment options are subject to market risks. In the last few years, many people’s investments took a hit along with the rest of the market. Enrollment is open all year. If your child decides not to attend college and you wish to use the money for something else, you’ll have to pay the income tax plus a penalty. Whether you choose one of these options or another route, the most important thing is to plan ahead for your child’s college education. It’s not cheap but it’s the best investment you can make in their future. So, preparing for it as early as possible is the best guarantee that you’ll have the funds when they are ready to send in their first college application. This article was first published on Mamiverse.